The aging process affects all people over time. While many people associate wrinkles and gray hair with aging, many people are caught off guard with how aging affects their smiles. Decades of biting, chewing, speaking, laughing, and personal bad habits will often begin to show their signs as people grow in years. If your smile has imperfections that can no longer be brushed away or lifted with professional teeth whitening, now is the time to consider porcelain veneers as a means of making over your smile. Many people shy away from cosmetic dental procedures because they are certain that they will be too expensive. However, porcelain veneers are one of the most affordable methods of achieving a new, attractive smile. You are not too old to invest in your smile! You have years left to live, which means you have years left to flash your smile to those around you. A bright, straight smile is a sign of youthfulness. A set of flawless teeth can take years off your appearance and give you the confidence to smile easily. One of the greatest advantages of porcelain veneers is their versatility. Porcelain dental veneers are used to “hide” many types of imperfections such as stains, discoloration, cracked teeth, chipped teeth, gapped teeth, and misaligned teeth. Porcelain veneers are thin shells that are attached to the front surfaces of the teeth to completely transform their appearance. Each veneer is custom-made to create a natural and beautiful appearance. 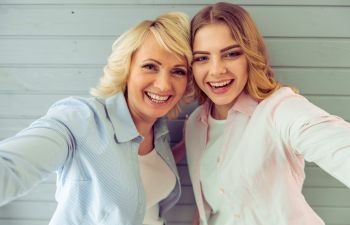 Many people use veneers to regain the smile they had in their youth, while others use veneers as a way to achieve a smile that they have always wanted. With the versatility of cosmetic dental veneers, you will be able to achieve a smile that you are proud to show off – and one that takes years off your appearance. At Gold Hill Dentistry, we want all of our patients to know that they are never “too old” to have a beautiful smile. If you would like to learn more about porcelain veneers and how they can greatly enhance your appearance, please contact our practice today to schedule a consultation. Your smile says a lot about you – make sure it says what you want it to for the rest of your life!